The small bow-shaped missile rises against the blue sky, turning into a tiny inverted comma, and then spirals in a long curve to land a few paces away from my feet. Jack, our burly Australian host picks up the boomerang. "Have a try," he urges our group, demonstrating how to hold it between thumb and fist. The boomerang is as unique to Australia as its aboriginal culture and its colonial past. 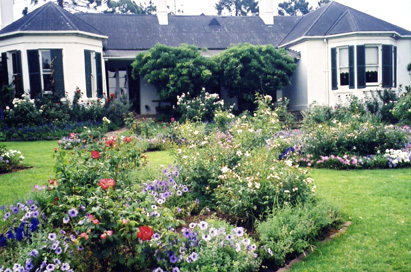 At Gledswood Homestead, that colonial history lives on in a gracious old sandstone manor which once belonged to the Chisholms, an early pioneering family. Built in 1810 with convict labour, it has been renovated over the years, and those selected rooms which are open to visitors, still retain an aura of bygone splendour. 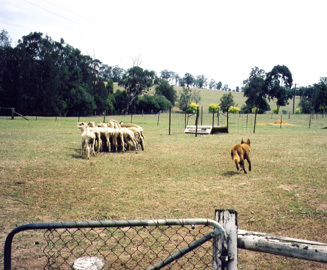 Although the estate still consists of 64 acres of rolling countryside in the Camden valley of New South Wales (the birthplace of the Australian wool industry), Gledswood is no longer a working sheep farm. Instead it celebrates its heritage by delighting visitors with an opportunity to experience typical Aussie occupations first hand. The day's activities include learning to crack a drover's whip, and watching a rangy brown Australian sheepdog corral a flock of alarmed looking sheep across a paddock and into a pen. Some of the "jumbucks" escape through a break in the fence, rushing blindly into our midst, followed by a determined Jock, who nips at their heels, and causes some of us humans to dodge nimbly out of the way. At the Stockman's Camp hut we pause for a mid-morning snack of billy tea and "damper" - a flat Aussie bread which would have been packed into the tucker-bags of drovers as they camped across the sheep farms which sprawl across the Australian countryside. The real show stopper, however, takes place in the shearing shed. I cross the timbered floor, littered with curly remnants from the last shaving session and take my place on a wooden bench. For the next half hour, I am enthralled by Jack's commentary on the life of a sheep shearer. Enthralled, but not envious. These workers were bent, head-at-knee-level, for eight hours a day, brandishing "blades" (gigantic scissor-like shears) as they shaved (or slaved!) away the animals. A good shearer was expected to denude up to 160 sheep a day. It took its toll. Arthritic hands, creaky spines and hip-joints. The blades endured until the 1926s, when they were replaced by a mechanical hand-piece, and this evolved in 1994 to wide electric "combs" which remain in use today. Jack regales us with tales of legendary sheep shearers-while a fat ewe is led onto the platform. Jack flops her over, shaves away the wool on her head and draws it down over the upper half of her face ("its called 'pulling the wool over the eyes'" he grins), and the animal relaxes into immobility. 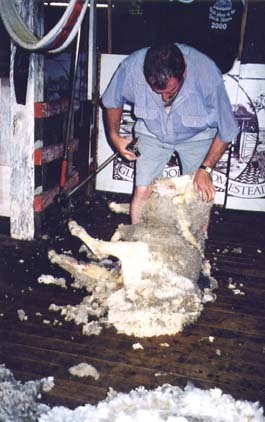 He holds the shearing comb against the skin, and it looks as simple as peeling a potato, the wool falling away in thick layers onto the floor. When he stands up and bows to our applause, Mrs Ba-ba now shorn to the skin, takes off in a hurry towards the exit! Then its time for what Gledswood calls "The Great Aussie Barbie" served in the dining hall, where waitresses in 19th century costumes fill our glasses with fine Australian wine, invite us to a lavish salad bar, and serve up enormous slabs of steak and glistening marinated chicken. And the close of my meal, the coup de grace: a generous slice of Pavlova desert-meringue, light as a maiden's fancy, cream as thick as an Irishman's brogue, and all of it topped with a riot of peaches, kiwi-fruit and strawberries. As they say "Down Under", "Gledswood is 'dinky-di' Australian". Too right mateys! Gledswood Homestead and Winery is approximately an hour's drive from Sydney and about 40 minutes from Sydney Airport.